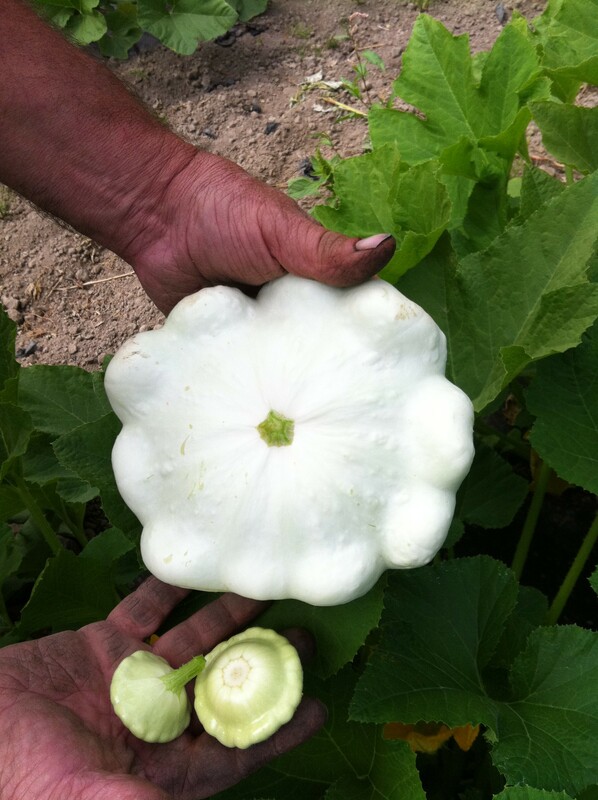 Summer Week 12: Just What is a “Pattypan”? This variety is from Italy, "Stregonta". It means "sorceress". It was supposed to be a pole strain, and we were saving seed, but it turned out to be a bush variety and they are done WAY early. They are pretty and delicious, nonetheless. We all know this has been a strange year. 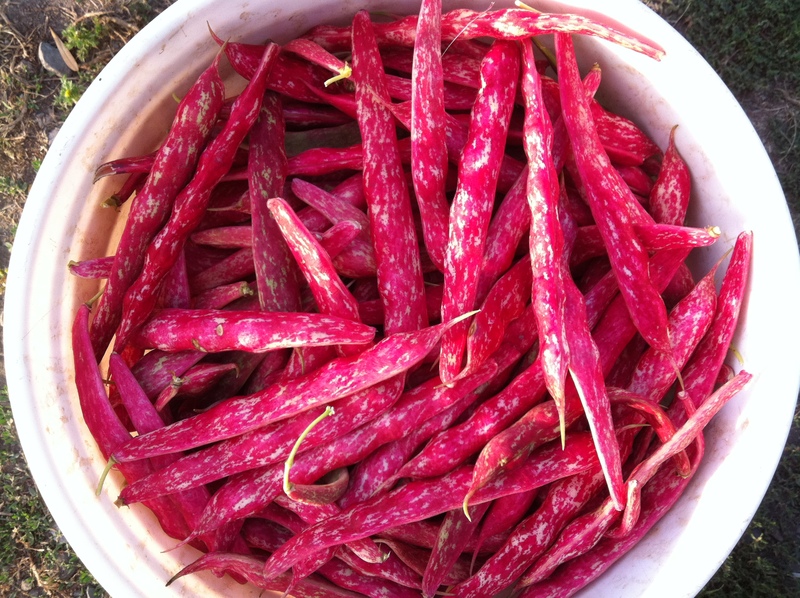 As yet another example, we already have shelling beans. In a typical year, we don’t have any varieties ready until at least the end of September. But not this year. The “Stregonta” are ready now, and the “Cannellini” will be ready in another week or two. Then the other varieties will follow. There is a whole page of recipes, so be sure to click on the link. 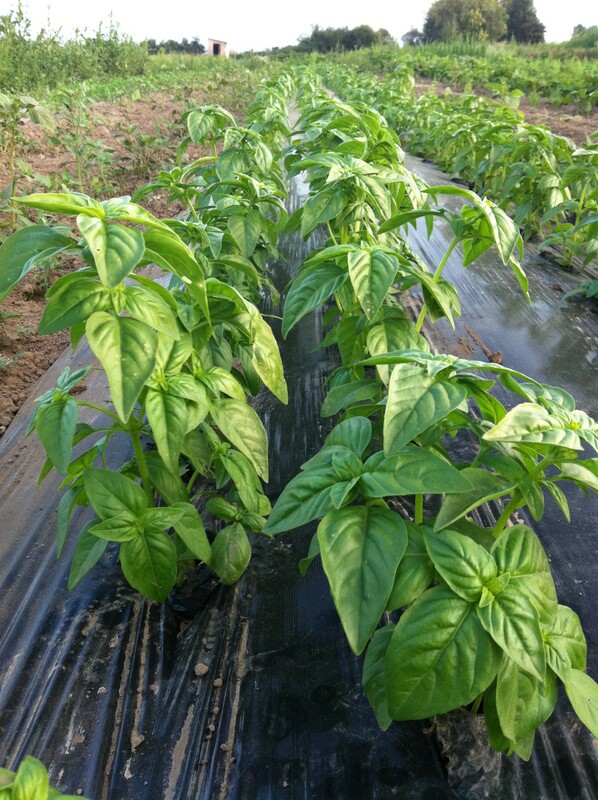 We planted 10,000 basil plants. Can you smell it yet? The basil is finally ready. We have waited for weeks for the little plants to grow big enough to bunch, and it has finally happened. Make pesto, or chop it up and toss it with your sautéed squashes, or just roll around in it. It smells and tastes amazing. We’re having pesto and pasta for dinner tonight, with Pecorino, of course. Beatrix Potter's, "The Pie and the Patty Pan". And now the story: I have wondered for years, maybe even decades, what is a pattypan? 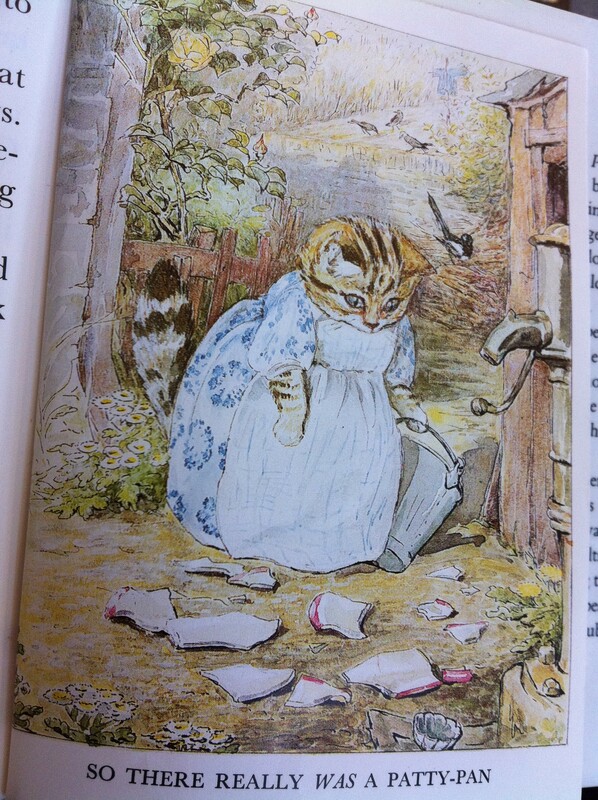 Last spring, as I sat in the childrens’ section of the library, I was browsing through the collection of Beatrix Potter books on the table. 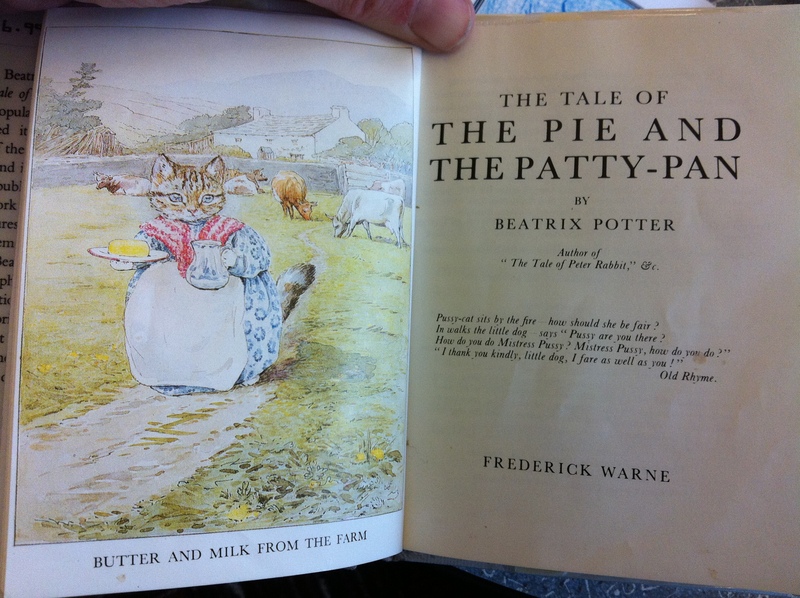 I thought I had seen them all, but then I saw a new one: “The Pie and the Patty Pan”. I gasped, and read it, and then took some pictures. I hope the copyright police don’t come and get me. So there really was a patty-pan. Poor Miss Kitty. There in the story, about a little dog and cat who are visiting and having a potluck, is a patty pan. It’s just a little pie tin, with scalloped edges. I have a number of them, for making single-serving tarts and pies. You can just see it in the bottom right of the picture. Pattypan Squashes. This variety is "Benning's Green Tint". There are a number of heirloom varieties in the Seed Savers' Exchange book. I once got seeds from someone in France, I remember one variety named "Patisson Panaché Vert e Blanc". It was pretty. After reading the story and looking at the illustrations, I could see why this type of squash was named a pattypan. Potatoes and garlic – dust off and store in a cool dry place. They’ll be there when you get home and need a potato salad. Chard – wash, blanche, and shock in cold water. Drain, wrap in wax paper and freeze in a ziploc baggy. Use like frozen spinach in a future meal. Lemon cucumbers – whip up a batch of refrigerator pickles. Stuff a pint jar full of cucumbers, and other veggies you have on hand (onion, squash, carrots, bell pepper, etc). Add some dried dill (also from the farm) and pickling spices if you have them. Whisk 1 cup white or cider vinegar with 1/2 cup sugar and 1/8 cup kosher salt (proportions are important when making the brine!) Pour the brine into the jar, cap, and chill. Pickles will be ready in about a week (right when you get home from vacation). Keeps for about 3-6 months in the fridge, but who takes that long to eat them? Basil – whirl into pesto with garlic, pine nuts, olive oil, salt, pepper, parmesan cheese. For a dairy free version, try a tablespoon of yellow miso instead of parmesan. Freeze until you get home and thaw and serve over pasta. Patty Pan – chop squash. Toss with tomatoes, chopped onion, olive oil, thyme, salt, and pepper. Roast until carmelized on a parchment lined baking sheet. Let cool to room tempurature. Freeze until ready to eat, serve over creamy polenta. Thanks for the great food!